Yesterday Feb 5 2019 we experienced a glorious rainbow after a line of showers hit the city. I saw the skies start changing colors with a greenish , orange hue becoming apparent. I drove 1/2 mile to the bay and was greeted with one of the most vibrant rainbows I have ever seen or photographed. I took 200 shots in the 15 minutes the rainbow was visible. 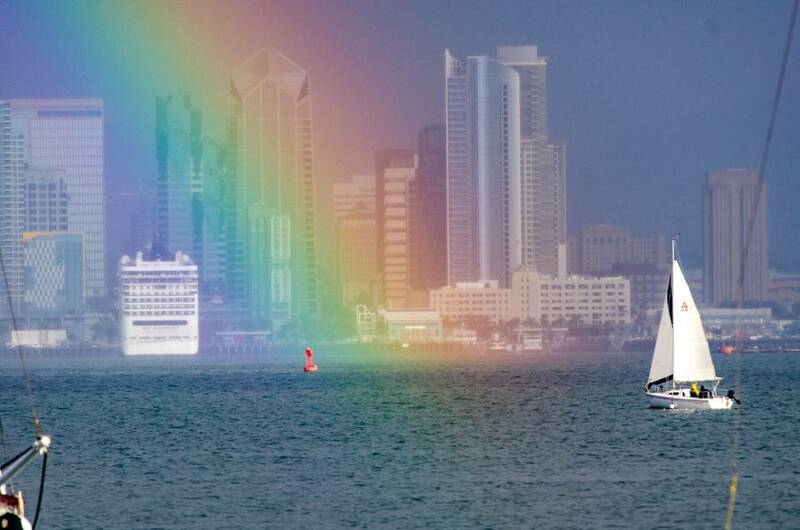 This one of a sailboat headed right into the colors gives me shivers every time I see it. I can only imagine the light mist falling and the shades of purple, green and orange they were seeing this is a very special photograph for me. I hope you enjoy it and sense the beauty and awesome feeling it gave me to take it. Saw this on the weather channel this morning. Nice shot.